well - I think I've temporarily lost my wonky house block mojo !! I only did one this weekend but hopefully I'll get it back soon now that I've done a few other blocks that I needed to get out of the way. I signed up for a few swaps and bees at flickr at the end of last year - the happy scrap quilt block swap was one of them and blocks need to be posted by 10 February so thought I'd better get them done - I was originally going to do four but then I thought I'd do 16 (plus one for the co-ordinator) so I pulled the fabrics last night and then cut them out and sewed today - the block we had to do is called an arrow block - quite quick and easy to do - 6 1/2" finished blocks. 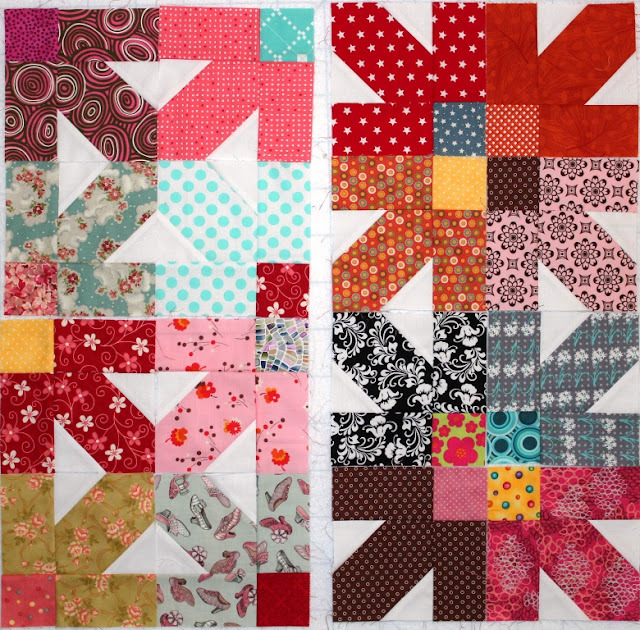 I think they've turned out ok and I'll do more to make a lap quilt after I receive the swapped blocks. Its amazing how arranging the blocks with the arrows pointing out changes the whole look ! hope you got some fabulous sewing in over the weekend ! Love those arrow blocks so much - they remind me of the union jack design. Gorgeous! I really do like those arrow blocks. Hopefully your wonky mojo was just taking a bit of a break and will come back soon. Wow. You're a swappin'-busy gal. Lots of good stuff there, and love all those bright colors. Ya done good at gettin' a lot done over the weekend! Your blocks look fantasic Leanne....gorgeous fabric..
Those arrow blocks are really striking. I bet it's fun receiving those in the mail. I'm sure your house mojo will be back soon, it's hiding under a piece of fabric. How neat to have a block swap. I will have to find one near my home. Thanks for sharing.